The Volt II Knife from Kershaw is a very versatile knife that features their patented SpeedSafe® assisted opening system. 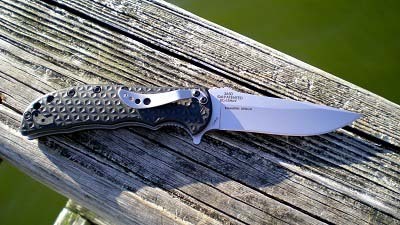 The convenience of the one-handed opening with the Flipper located on the back of the knife makes it an excellent candidate for a primary fishing knife. With such great initial features for a fishing knife, we were very interested in testing it in an actual fishing situation and seeing how it did up against the elements. SpeedSafe®: The Volt II features SpeedSafe®, which is a spring-assisted opening system built into the knife that allows for convenient one-handed use. It is a patented system that assists the user to smoothly open the knife by pulling back on the Flipper located on the back of the knife. It uses a torsion bar that keeps the knife closed and prevents accidental opening. To open the knife all you have to do is overcome the resistance by applying pressure to the Flipper. The blade snaps open very smoothly and quickly and locks into place. Locking Liner: This is a locking feature that locks the blade into position after it has been deployed. To release the lock, you press the spring-loaded bar to the side, and the blade will fold back into the handle. This makes it very simple to put the knife away with one hand. Pocket Clip: The pocket clip is a very study steel clip that securely tethers the knife to any piece of clothing or equipment. It will not move around, but it will easily pull free when you need to use the knife. Limited Lifetime Warranty: Kershaw offers a lifetime guarantee for their products. They offer to repair or replace any product that has factory defects, or flaws in its original material; the warranty does not cover normal wear, abuse, or neglect. In addition, they offer free sharpening if you ship your knife back to them. In order to test the Kershaw Volt II knife, I brought the knife along for a typical afternoon fishing trip. One of the first things I noticed was that it had a very secure pocket clip, which offered reassurance that the knife was not going to go anywhere while I was busy rigging rods. I used the Volt II for a variety of fishing functions, the main one being cutting line. The fine blade of the knife performed very well for cutting line. It came with a sharp edge from the factory which allowed me to cut through monofilament, fluorocarbon, and braid with ease. I also used the knife for a few bait modifications: scraping off paint from a jig head, and shortening a spinnerbait skirt. Overall, the blade of the Volt II performed very well in all of these areas. 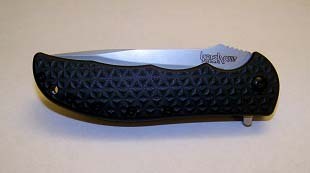 The outstanding feature of this knife is that it offers easy access and incredibly simple one-handed opening and closing, which is essential while fishing. I tend to use assisted-opening knives while fishing because I almost never have two free hands to work a knife when I’m tying knots and holding a rod. The SpeedSafe® opening makes it almost a no-brainer for which knife to grab in that situation. A simple push on the flipper located on the back of the knife will cause the blade to flip out and lock into place. Opening the Volt II provides solid, tactile feedback that really provides a feeling of the power and quality of the knife. 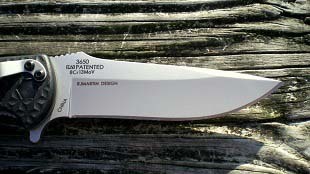 The only downside I found about the knife was that the handle is not particularly great in wet conditions. It is made from injection-molded polyimide, which does not grip well when wet. The Kershaw Volt II is a quality knife for that boasts great value for the money. It also has a wide variety of uses, fishing included. It offers a versatile design which allows the knife to be used for a variety of applications and excel in every one of them. The one-handed opening and closing is the key feature that makes the Volt II perfect for a fishing environment, and I would recommend keeping this knife within reach while you’re out on the water.